The announcement comes as a great endorsement of Scouting’s commitment to allow adults to volunteer their time on a flexible basis. The Duchess will help run a variety of activities relevant to her skills and interests. This could include running games, teaching first aid or cooking on campfires. On one hand this is a very positive story about a high profile member of the royal family showing support for the Scout Association, while also giving a big boost to flexible volunteering and showing that if she can give some time to fit scouting in to her busy lifestyle then anyone can. However on the other hand I have some concerns. Scouting is often looked at as a social leveller, it was part of what BP did by taking boys from both classes to Brownsea island. As such what then happens to royal protocol – do her fellow leaders call her Kate or maybe she will take a name like Squirrel (for beavers) or Winifred for cubs (Winifred is Colonel Hathi’s wife, after all William is a colonel in the Irish Guards) or as protocol decrees is it Your Royal Highness followed by Ma’am? Finally though what’s going to happen if the press get a photo of The Duchess helping out little Jonny or Jenny and the pack does not have a signed form allowing the use of photos or maybe the parent has decide they don’t want photos of the child used and has informed the group. Are the pressgoing to check with the group before publishing every photo? They are not known for their consideration on these matters. My concerns are, I will admit, very minor and on the whole it is very positive having some one like the Dutchess of Cambridge being part of the Scout Association in any form. I also feel that the felxible voloutering which the Scout Association offers is a great way for people to support the movement with as much or a little time as they have. I hope that the group where she volunteers will be given the support throughout the full three years (if that is what she is doing) of Her Royal Highnesses appointment not just while there is a lot of media hype. From what I’ve read, she’ll be doing her stuff with the Colonies and Packs as a personal thing, so no press or photos. I do hope that the press do behave when it comes to photos and potentially disrupting activities. Having said that 20 or so Beavers going screaming towards a ‘pap’ might well scare them off! I might be wrong but I can’t see it being a personal thing, or she would have just joined up without the hype. it is not Kate Middleton helping at Cubs it is The Duchess of Cambridge on official business. There will be lots of publicity when she goes to her first meeting or attends an event, I mean you would never have a low turn out at a District meeting or AGM would you. Something that can increase the publicity of what is already a great story is a good thing. I mean I am not sure there is a benefit from her actual time, limited as it will be, but from a publicity saying if she can do it so can you. Everything I have read has mentioned the shortage of leaders and followed with if she can give some time in her busy schedule so can you. Firstly, I would say that I would hate to be the Section leader, where Kate helps out. Imagine the amount of scrutiny and pressure from leaders up above in district, county and HQ. No thanks, sounds like a whole load of extra work for the group leaders. Secondly, what’s with all this ‘Kate’s joined, we’re going to get loads of new adult helpers now’ that is coming from scouting people if you look around the internet. I don’t expect it to have any effect on my group, my brother’s group or the vast majority of my friend’s groups. To take the assumption that because Kate joins as a helper, will suddenly mean adults are flocking to join is ludicrous. If people want to help as leaders will help anyway, those kind of people will actively come and help. Then there are those that would like to help but can’t due to circumstance. People in recent years are finding it harder to keep their jobs, look for jobs or to put food on the table, let alone give time to help. Myself for example, on a low income, in a poor rural area, my wife, kids and I travel nearly 100 miles to get to and from scouting. To be honest, we’d be a lot better off giving up scouting. Thirdly, those that don’t help, just won’t help anyway. All Kate is going to really do is create extra awareness of Scouting, it will have minimal effect but at least it’s good awareness. Plus has someone been listening to my campfire chats, 5 years ago one night around the campfire, we’d been talking and I said we could do with a Ray Mears type person or someone like Prince William of that standing to join to help promote Scouting. I was close!!!! Anyway I’ll say here and now, I’d like Helen Skelton to sign up, excellent young woman with get up and go, who would appeal greatly from Beavers to Explorers. Anyway stopping now, rambled on too much. Do you not believe that the extra awareness is around making people see that they can give 1 hour a week to collect the subs at the end of the night and put them into a spreadsheet helping out the troop. I remember at our scout we has terrible trouble collecting subs, because parents fly in and fly out and we were busy talking to parents sorting out the Young people we did not always catch all the parents. Eventually we asked for help the right way (http://jabbering.co.uk/2010/11/asking-for-help/) with a specific need. e.g. we asked for someone to act as our bailiff and collect in subs, this parent came forward he was done and scout every week to collect his son he just came a little earlier with a list of kids and went round all the parents as they arrived and asked for the sub. It was not a huge role or a major commitment for him but to us as leaders it was invaluable it also kept the treasurer off our backs. The ideas is get people to see that even if you can only give one hour the better than giving nothing. I agree that having Kate as a volunteer will help create some awareness. But this kind of thing isn’t what recruits leaders or helpers, would it have enticed you if you weren’t already in Scouting? Probably not, it wouldn’t me. The recruitment of leaders has been a problem since scouting began, it hasn’t been solved in that time and it won’t ever be solved unless you have a shift in society. I quite admire the american model of society, where people are celebrated or praised by society for giving their time. Where workplaces offer time off to volunteers because it brings rewards back to the company with loyalty and improved image. In this country, many are mocked by work mates for Scouting, people see it as skiving off. Society in this country don’t doesn’t see the benefits of volunteering to it, and until then the situation will never change. That is why I believe in going out and targeting specific people to join as leaders, my wife and I have recruited 12 leaders in just a couple of years. A bit like your example, work out your problem and then go out and get someone to solve it. Publicity is one thing, but it’s real help at the ‘coalface’ that’s needed. Our group has always found it difficult to recruit leaders, helpers we can find but real help is hard to come by. I really appreciate the help our parents put in, but managing a troop with myself, an ASL and 4 YL’s when the scouts often number 40 is hard. Whilst flexible volunteering is all the rage, it’s still us poor few who the burden often falls. it’s interesting to speculate that now Kate has ‘joined’ who the next Chief Scout will be? I’m predicting a woman. (Helen Skelton would be ideal, or maybe someone like Jessica Ennis ? )think what the die-hards would make of that, you can just see the threads on the forums. I am not sure about a woman yet, I think TSA will try and make Bear do a second term. He has been good for the movement so far and I think they will want to build on that good work. I’ve been working on getting Helen on board as a Cumbrian Scout Ambassador for a while. She’s always been keen to give her support but has been held back by her agent. However I’m still hopeful of making progress later this year. Helen is a real inspiration and can enthuse adults and young people alike. Eddie Ward, just thinking if you need to interview Helen for the role, I can be available even at short notice. But seriously I think that would be a great idea, good luck with it. Amazing how many men are keen on the Helen Skelton proposal! 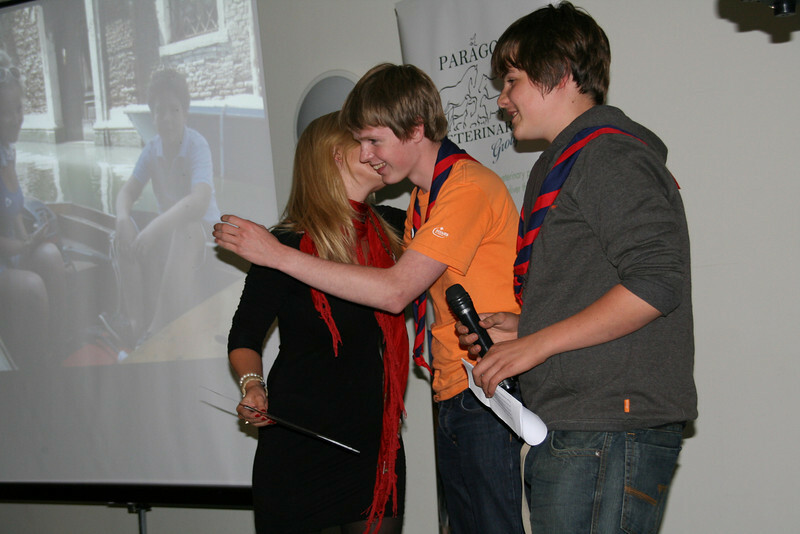 She certainly made a couple or my Explorer Scouts happy! But as I have said she is a genuine inspiration and her entusiasm knows no bounds. Back off Chris 😛 I offered first.